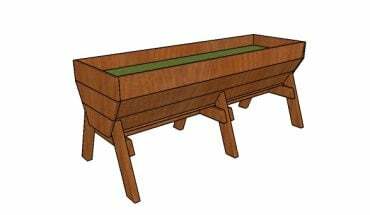 This step by step woodworking project is about planter box plans. I have made plans for this square planter box, so that you can enhance the look of your property with very small costs. This wood planter box has a simple design that can match the style of the rest of the outdoor furniture. Follow my instructions and tips, so you get the job done quickly and without no problems. See my other DIY projects HERE. The first step of the project is to build the frames for the planter box. Cut the components at the right dimensions and align them attentively. Make sure the corners are square and drill pilot holes. Insert 2 1/2″ screws to lock everything together tightly. Continue the project by attaching the 2×6 slats to the sides of the planter box. Drill pilot holes and insert 2 1/2″ screws to secure the slats into place. Leave no gaps between the slats for a neat result. Fit the rest of the slats to the planter box. Next, attach the 2×2 legs to the planter box. Drill pilot holes and insert 2 1/2″ screws to lock the legs into place. Attach the 2×4 slats to the bottom. Build the top trims from 1×4 lumber. Cut both ends of the trims at 45 degrees and secure them into place with 1 1/2″ brad nails and waterproof glue. Fill the dents with wood putty and smooth the surface with 120-220 grit sandpaper. This planter box is ideal for any front porch or backyard patio. You can use the planter for large pots. If you like my project, don’t forget to SHARE it on Facebook and Pinterest. Thank you for reading our project about bbq table plans and I recommend you to check out the rest of the projects. Don’t forget to LIKE and SHARE our projects with your friends, by using the social media widgets. SUBSCRIBE to be the first that gets our latest projects. I just made this yesterday and it turned out great.. however, the plan needs some corrections. Under the “Material” list, both C & D call for 2x4s, however, in the step-by-step instructions, it correctly calls for 2x6s. In the list of items to purchase, 1 5/8″ screws are listed, however, these are not called for/used in the step by step instructions. Pretty simple to figure out on your own as you’re building it, and the number of items you need to purchase are correct, so you don’t have to go back to the store because the list is wrong, but figured you’d want to know so that you can correct it. Thank you for the feedback. I have updated the cut list. The 1 5/8″ screws are listed as a possible substitute for the nails, to secure the trims into place. I have seen you planter box and it looks awesome. I will post it on the blog in a few days. Thanks for sharing and I’m looking forward to seeing your future projects! Is the planter hefty enough for trees to be in it? I need a planter large and hefty enough to hold saplings until I can plant them permanently in a few years.